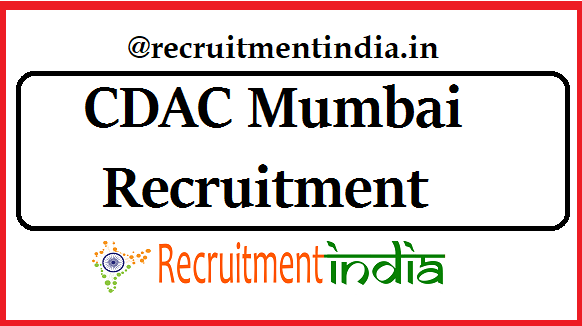 The registration process of CDAC Mumbai Recruitment 2019 for 91 Project Engineers and Project Manager Vacancy has opened on 10th April 2019. Attentively check the CDAC Project Engineer Recruitment eligibility then register your name. In the Post Wise CDAC Mumbai Application Form is attached, so select the posts that are appropriate for you. CDAC Mumbai will check all the registered CDAC Mumbai Project Engineer Online Form, it will reject the forms that are matched with the post requirements. Hence before paying the fees to recheck the details entered in the CDAC Mumbai Recruitment 2019 registration form. Certainly, there will be an ambition for the Engineering degree holders to pursue the career in the Central Government board i.e CDAC The offer has come towards in the form of latest CDAC Mumbai Project Engineer Recruitment 2019. Only for the B.E/B.Tech qualification contenders this CDAC Mumbai Recruitment 2019 is applicable. CDAC has various branches across India, now the present given 91 Project Engineer and Project Manager Vacancy is for the location of the Mumbai. Central Government job in Mumbai is definitely a good success for the applicants. Who got selection letter by means of the latest CDAC Project Engineer Recruitment will have to stay at Mumbai region. Aspirants who are ready to relocate at the Mumbai location have to check the more details of the recruitment. Few of the candidate will think about the job posting place after they have got the job offer letter. Actually, that’s is wrong while applying the CDAC Mumbai Recruitment 2019 one has to decide to do the job as per the requirement of the CDAC board. CDAC may change the job posting if there is more requirement of new Project Engineers in any other branch. We are giving the clear cut view of CDAC Mumbai Project Engineer Recruitment 2019 then wisely take the decision of registering your name against this latest CDAC Project Engineer Notification. For the selected candidates in the CDAC, a wonderful career is waiting for them. CDAC instructed the contenders to enroll for this recruitment only if you have the proper eligibility criteria. 1st Class B.E/ B. Tech./ MCA/Masters in Technology (M. Tech)/ Masters in Engineering (M.E)/ Ph.D. in relevant discipline along with experience. CDAC Mumbai Project Engineer Selection Process is written exam/Interview. Confirmed round of recruitment will inform after the application process. SC/ST/PWD/ EWS/ Female category Applicants: No fees. Application fees have to be paid only through debit/credit cards. No cheque, DD or cash are not accepted for payment of application fees. For all of the applicants verifying the CDAC Project Engineer Eligibility Criteria through the notifications is not comfortable. Hence for their sake, we have given the right way of explanation of each and ever eligibility criteria like educational qualifications, age limit. This eligibility criteria checking is must to know are you the applicable contenders for the CDAC Project Engineer Notification. Some more details are there for which the applicants are willing to check. Those are CDAC Project Engineer Vacancy details, CDAC Project Engineer salary, Project Manager pay scale, application fees details. These particulars are described in this page for the verification by the applying ones. Hopefuls, don’t waste the time you have to submit the CDAC Project Engineer Online Form before 26th April 2019 closing day. From 10th April 2019, only CDAC Mumbai has begun the process of taking the application process. This states only in between the dates 10th to 26th April 2019 www.cdac.in Project Engineer Application Form can be submitted by the competitors. In the CDAC Project Engineer Vacancy, there are three different cadres. Know the cadre of Project Engineer posts you are eligible, fill the application form for that post only. All the applicants have to select the application form of their eligibility matched post. Selection rounds of CDAC Mumbai Recruitment 2019 will be informed to the contenders through their given mail id in the registration form.